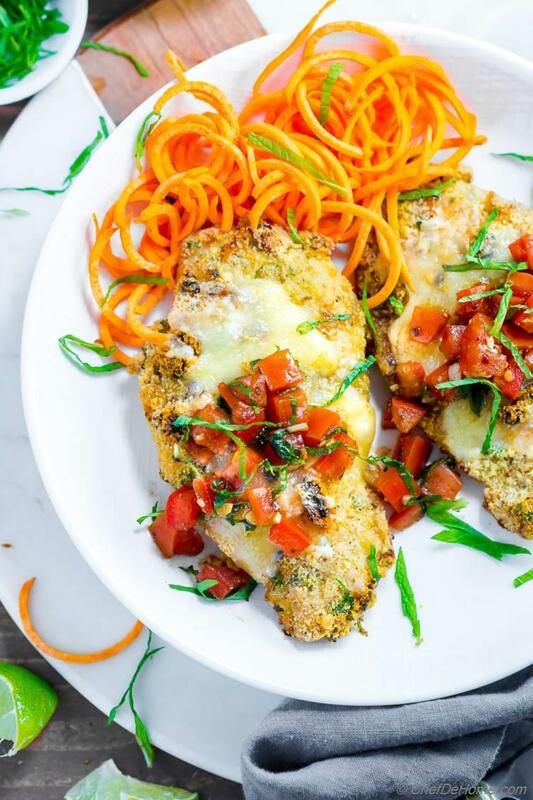 Almond Crusted Baked Bruschetta Chicken is lightened-up version of traditional Bruschetta Chicken with nutty baked almond crust, with topping of fresh garlic and tomato bruschetta. Gluten free. Bruschetta topping is one of my favorite thing about this chicken bake. Whole recipe uses only a touch of cheese, is loaded with flavorful bruschetta topping. 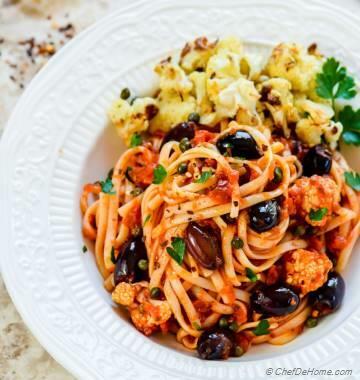 Lots of freshness of sweet tomatoes, basil with touch of garlic, chili and balsamic vinegar. It makes simple chicken bake over-the-top delicious. 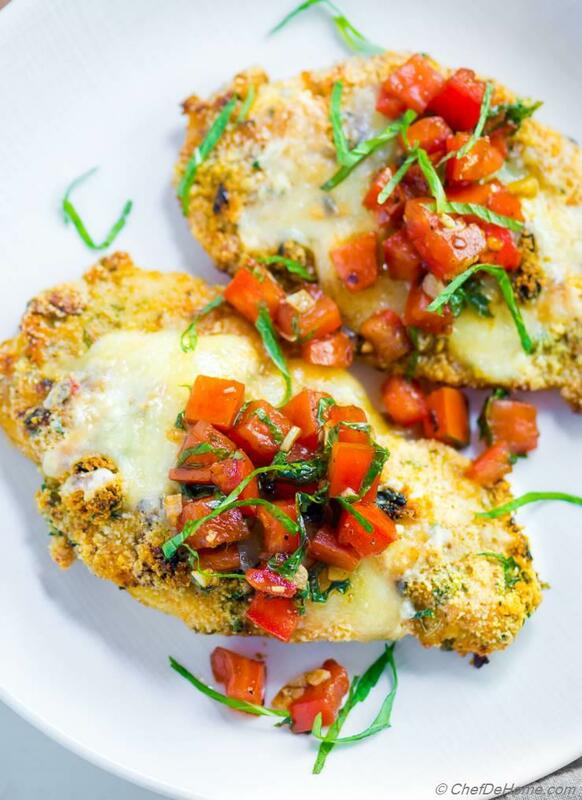 Simply, if you like Bruschetta.. you gonna love this Bruschetta Chicken recipe. Bruschetta Chicken bake is my favorite chicken dinner because it is so easy to put together. Plus baked version with flourless almond crust is not just healthier but delicious. I decided to bake the almond crusted chicken with coat of oil spray. This was perfect for me because I wanted a lite chicken dinner, very low in fat calories. Where baked crust for this chicken recipe was my favorite. I must share that Vishal liked the pan-fried version better. Pan-frying makes almond crust more nutty and crunchy. So, if you are vary of oil, baking is the way to go. Or, pan-fry and finish in oven until chicken is cooked through. No matter if you bake or fry, thanks to carb-free almond crust.. This recipe goes towards my 30 Days of Low-Carb Diet. Almond Crust is just like regular bread crumb crust. Only, bread crumbs are replaced with coarse almond meal. I coat the chicken in egg wash. This helps seasoned almond meal stick to the chicken. 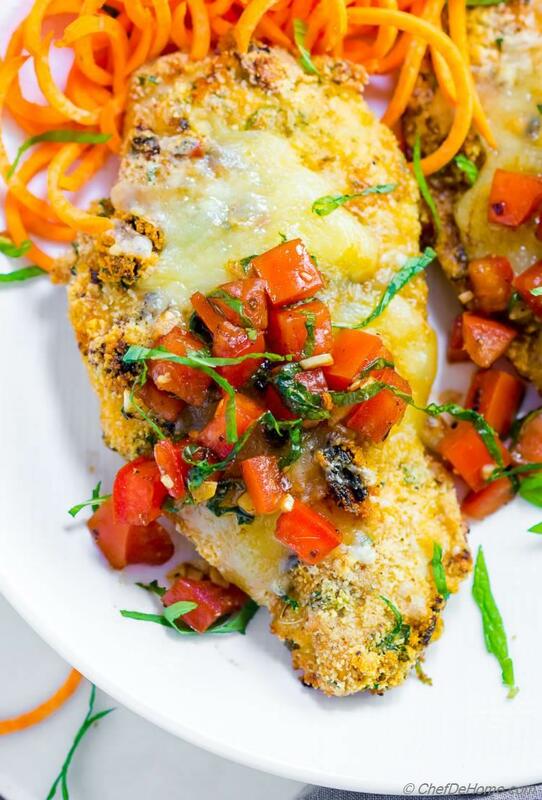 Almond Crust Bruschetta Chicken is also great if you serving a gluten free meal. My Bruschetta topping recipe is easy and bursting with flavor. Diced tomatoes, garlic, hint of chili flakes, basil, and balsamic. That's it. Surprisingly, these 5 simple ingredients make world's best tasting Bruschetta topping ever. 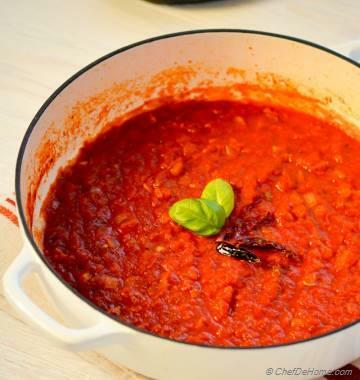 The sweetness of balsamic vinegar, sharp garlic, sweet tomatoes and basil.. What not to like?! This Bruschetta topping also great to serve on traditional Bruschetta with toasted bread. TIP: For more color, use rainbow cherry tomatoes or try my Sweet Pepper Bruschetta Recipe. I hope you will enjoy my lite take on Bruschetta Chicken. Bring home some tomatoes, basil, and balsamic. 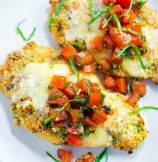 Try this easy baked Bruschetta Chicken for Sunday dinner. Update: For One Pan Baked Bruschetta Chicken, try this new Recipe. 1. Heat olive oil in small pan until just warm. Add minced garlic and chili flakes. heat for 10 second and take off heat. Set aside. 2. 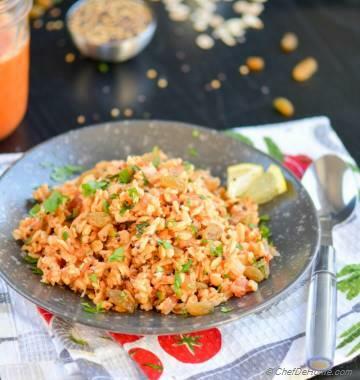 In a bowl, add diced tomatoes (seeds removed). Flavored garlic chili oil, balsamic, chiffonade basil with 1/4 tsp eaxh of salt and black pepper. Toss to combine. Taste and adjust salt. Cover and set aside. Keep seeds to add to a stew or sauce or curry paste. 4. Prepare a baking sheet with with foil or parchment paper. Dip each chicken piece in egg wash. Let the access drip, then place in almond meal mixture. Press to adhere coating onto chicken. Place in baking sheet. Repeat for all chicken pieces. 5. Cook at 375 for 30 minutes or until topping is brown and chicken is cooked through. (170 degrees on Instant read thermometer.) Remove sheet pan from oven, top with shredded cheese. Broil until cheese has melted. 6. Top with Bruschetta topping. Serve and enjoy!